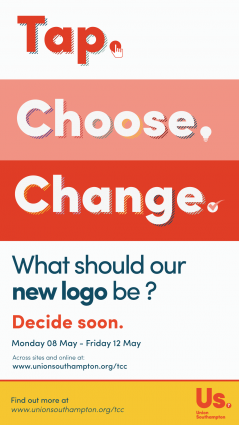 In October 2016, following our All Student Vote, you voted to keep the Union Southampton brand and have the SUSU* name back so we designed three concepts for our new logo. 2,393 of you (over 10% of the membership) have had your say this week in our Tap. Choose. Change. consultation to decide what our new logo should be. With 1,018 votes (42.5% of the choices), we are pleased to reveal our brand new logo. Without further ado…. The implementation will begin in June, ready for our Open Days in July. Until then, we will be busy creating colourful signage and updating our look. *To clarify, we have changed our official charity name from Union Southampton to University of Southampton Students’ Union (commonly known as SUSU on campus).